To toast fresh bread: Preheat oven to 350°F. Place cubed bread on a large rimmed baking sheet. Toast bread in oven 5 to 10 minutes or until just barely toasted and no longer soft. Remove from oven and allow to cool before tossing with remaining ingredients. In a large bowl, toss bread, tomatoes, cucumber, onion, basil, olive oil, salt and pepper until just combined. Let sit 4 hours at room temperature to marinate. In a small saucepan over high heat, bring balsamic vinegar to a boil. Reduce heat to a very low simmer and cook vinegar for 10 to 15 minutes until the liquid reduces by half and is syrupy. Remove from heat and set aside. Toss mozzarella cubes with salad; serve immediately drizzled with balsamic reduction. 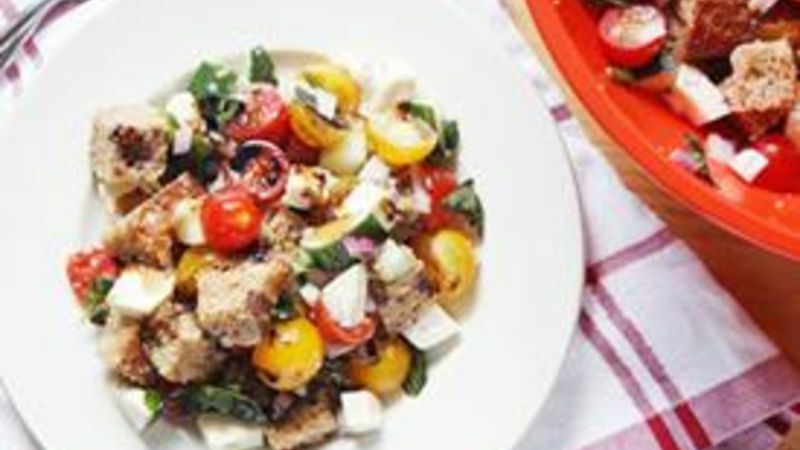 When I finally have my first backyard garden, I’m going to build it around this Summer Panzanella Salad. You think I’m kidding. But when you take one bite of this unbelievable deliciousness – chock-full of fresh veggies like cucumber, red onion, cherry tomatoes and fresh basil tossed with bread, cheese, olive oil, balsamic vinegar and magic – you’ll understand. It’s all I need in this world to make me happy (well, that and coffee). This salad originally was born out of a mistake, as many good things are. But I have to say, I’m glad it happened! Because otherwise, I wouldn’t know the wonder that is a panzanella salad, often made with stale bread and fresh tomatoes soaked in olive oil and tossed with veggies. I added a little fresh mozzarella cheese, basil and a balsamic vinegar reduction for a caprese-ish feel, and that was the End of Life As I Knew It. From then on, this salad would be a staple in my summer menu. And it never gets old (well, the bread does, but that’s the point. ANYWAY…). What I love most about this recipe is how substantial it is, but with very little effort. It’s the kind of recipe that’s custom-made for summer: No-cook, no-fuss and celebrates all the fresh flavors of the season. You can serve it as a main dish and even the staunchest salad-haters will probably turn into salad softies after one bite, but it also pairs well as a side dish to a light dinner. As for those who love salad anyway, well, welcome to salad nirvana. There’s no turning back now. You might as well start building that garden, too.